Hello everyone, today I thought I would show you this layout & card I have just done for my Design Team post over on the Green Tara blog. Of course I have used loads of gorgeous Green Tara flowers & ribbons, which as most of our locals know we stock loads & loads of Green Tara at our shop at The Entrance. 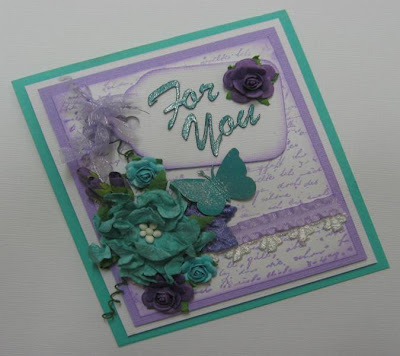 I have also used lots of the gorgeous 2 Crafty chipboard (which we also stock huge quantities of) including these Scalloped Circles, Flourish Circle Frame & Mini Words on the layout & the little butterfly & Card Greeting Words on the card. For more info & more close ups pop over to the Green Tara blog. These are beautiful Di, I love these colors together!! Once again, Di, these are both beautiful. You obviously love that teal colour...the purple/mauve with it looks so pretty. There is something special about the design of the layout...the balance is perfect - Fibonacci himself would be impressed!!! So beautiful Di, love this!! I have also applied for the 2 crafty call!! Wish me luck! !